Count on Original HP Toner cartridges with JetIntelligence to deliver high quality at fast speeds, plus affordable high-yield options and anti-fraud technology to ensure consistent HP quality—something the competition can’t match. 1 HP LaserJet Original Toner Cartridges with JetIntelligence released after 2015. Highest capacity cartridges compared to predecessor highest capacity toner cartridges. For more information, see http://www.hp.com/go/learnaboutsupplies. 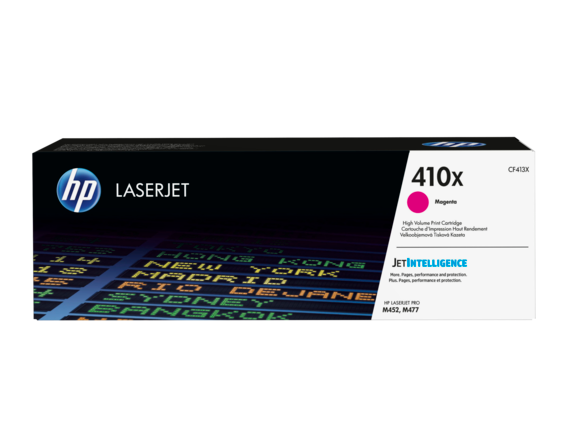 2 HP 410X High Yield Black/Cyan/Yellow/Magenta Original LaserJet Toner cartridges are not included in printer purchase; purchase separately. Learn more at http://www.hp.com/go/learnaboutsupplies. 3 As compared with cartridge gauges for predecessor products. 4 Approximate average yield based on ISO/IEC 19798. Actual yield varies considerably based on content of printed pages and other factors. For details, see http://www.hp.com/go/learnaboutsupplies. Count on Original HP Cyan Toner cartridges with JetIntelligence to deliver high quality at fast speeds, plus affordable high-yield options and anti-fraud technology to ensure consistent HP color quality—something the competition can’t match. 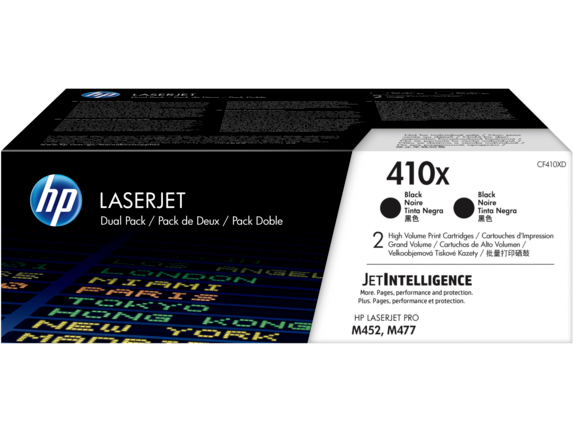 1 HP LaserJet Original Toner Cartridges with JetIntelligence released after 2015. Highest capacity cartridges compared to predecessor highest capacity toner cartridges. For more information, see http://www.hp.com/go/learnaboutsupplies. 2 HP 410X High Yield Black/Cyan/Yellow/Magenta Original LaserJet Toner cartridges are not included in printer purchase; purchase separately. Learn more at http://www.hp.com/go/learnaboutsupplies. 3 As compared with cartridge gauges for predecessor products. 4 Approximate average composite cyan, yellow, magenta yield based on ISO/IEC 19798. Actual yield varies considerably based on content of printed pages and other factors. For details, see http://www.hp.com/go/learnaboutsupplies. Count on Original HP Yellow Toner cartridges with JetIntelligence to deliver high quality at fast speeds, plus affordable high-yield options and anti-fraud technology to ensure consistent HP color quality—something the competition can’t match. Count on Original HP Magenta Toner cartridges with JetIntelligence to deliver high quality at fast speeds, plus affordable high-yield options and anti-fraud technology to ensure consistent HP color quality—something the competition can’t match. 1 HP LaserJet Original Toner Cartridges with JetIntelligence released after 2015. Highest capacity cartridges compared to predecessor highest capacity toner cartridges. For more information, see http://www.hp.com/go/learnaboutsupplies. 2 HP 410X High Yield Black/Cyan/Yellow/Magenta Original LaserJet Toner cartridges are not included in printer purchase; purchase separately. Learn more at http://www.hp.com/go/learnaboutsupplies. 3 As compared with cartridge gauges for predecessor products. 4 Approximate average yield based on ISO/IEC 19798. Actual yield varies considerably based on content of printed pages and other factors. For details, see http://www.hp.com/go/learnaboutsupplies. 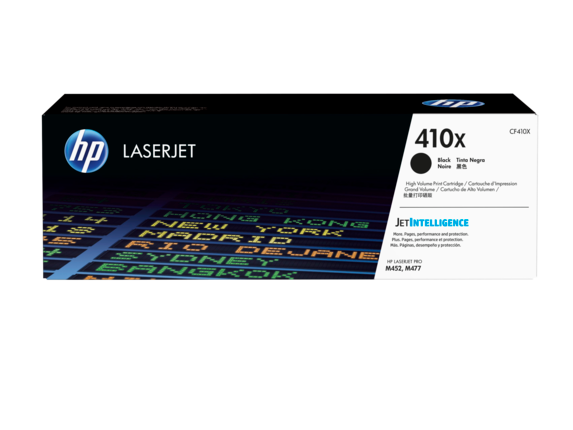 5 Based on cartridge yields for HP 410A compared with HP 410X Original HP toner cartridges. For more information, see http://www.hp.com/go/learnaboutsupplies. Count on Original HP High Yield Cyan Toner cartridges with JetIntelligence to deliver more pages than ever—fast—plus affordable high-yield options and anti-fraud technology to ensure HP color quality—something the competition can’t match. 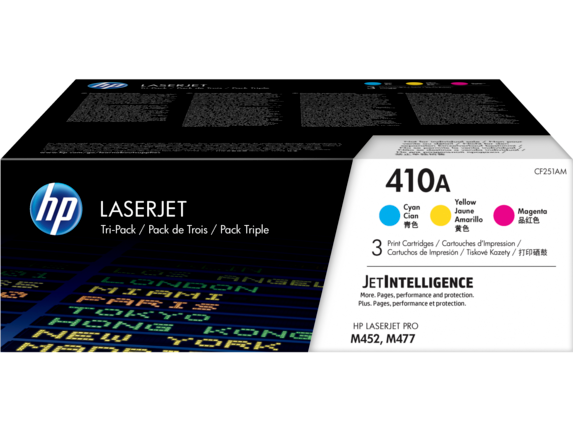 1 HP LaserJet Original Toner Cartridges with JetIntelligence released after 2015. Highest capacity cartridges compared to predecessor highest capacity toner cartridges. For more information, see http://www.hp.com/go/learnaboutsupplies. 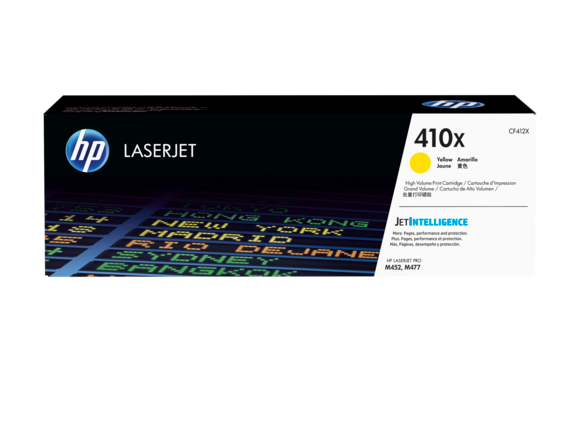 2 HP 410X High Yield Black/Cyan/Yellow/Magenta Original LaserJet Toner cartridges are not included in printer purchase; purchase separately. Learn more at http://www.hp.com/go/learnaboutsupplies. 3 As compared with cartridge gauges for predecessor products. 4 Approximate average composite cyan, yellow, magenta yield based on ISO/IEC 19798. Actual yield varies considerably based on content of printed pages and other factors. For details, see http://www.hp.com/go/learnaboutsupplies. 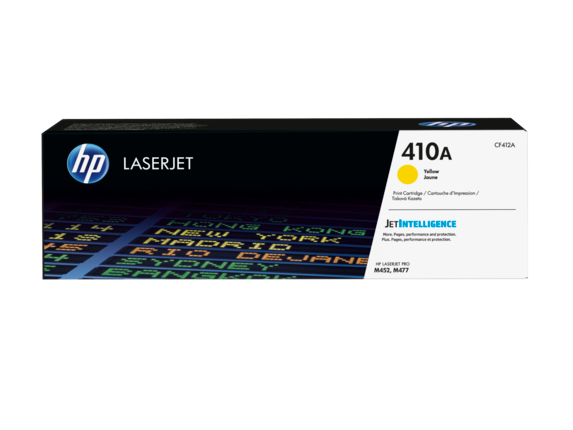 5 Based on cartridge yields for HP 410A compared with HP 410X Original HP toner cartridges. For more information, see http://www.hp.com/go/learnaboutsupplies. Count on Original HP High Yield Magenta Toner cartridges with JetIntelligence to deliver more pages than ever—fast— plus affordable high-yield options and anti-fraud technology to ensure HP color quality—something the competition can’t match. Count on Original HP High Yield Yellow Toner cartridges with JetIntelligence to deliver more pages than ever—fast—plus affordable high-yield options and anti-fraud technology to ensure HP color quality—something the competition can’t match. Count on Original HP Color Toner cartridges with JetIntelligence to deliver high quality at fast speeds, plus affordable high-yield options and anti-fraud technology to ensure consistent HP color quality—something the competition can’t match.